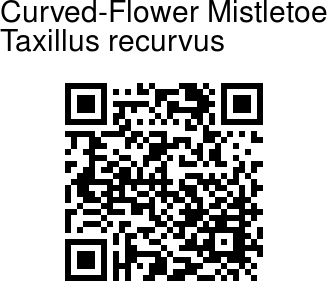 Curved-Flower Mistletoe is a parasitic shrub with rusty branchlets, growing on trees. Leaves are obovate, 3-5 x 2-3 cm, base wedge-shaped, tip blunt, blackish green above when dry, thinly grey-velvet-hairy below; leaf-stalk up to 1.5 cm. Flowers are borne in cymes which are up to 6-flowered, rusty. Bracts are ovate, free from the calyx, but partly enveloping it below. Sepal-tube is 3 mm; teeth 5, irregularly lobed. Flowers are 2 cm long, tubular, yellowish green, 8 mm wide. Flower-tube is curved, split half-way, inflated below the middle, rusty-hairy; with 5 petals. Stamens are 5, style 2 cm. Drupe is oblong to flask-shaped, 1 x 0.4 cm, rusty. 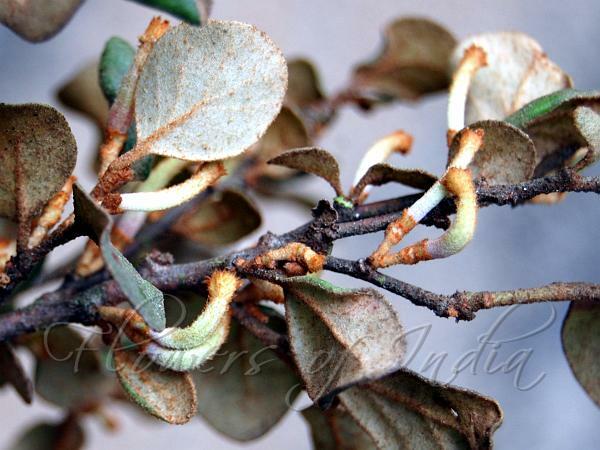 Curved-Flower Mistletoe is endemic to Western Ghats. Flowering: October-December.